Your blog can have a name. If you don't pick a name it will be automatically named after yourself, but that's simply not fun. My blog is called lunatic meeps, which is a shout to a friend that says meep all the time, and to my old tiny guild called Banished ( a guild with a story....about the moon). So really, I hope that anyone who takes this feature half-seriously, will also pick a name for his/her blog. 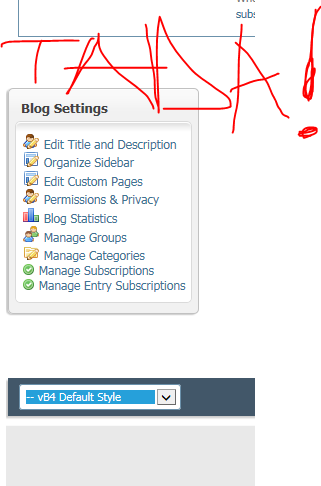 Ok, so I got here by clicking on a button called settings, which is, regardless of your forum theme, near the top of the screen. It can be more to the right or the left, but it's there. You can change all sorts of settings, and also blog settings, which as you can see, are near the very bottom of the page (click that). As you can see, the very first item is called "Edit Title and Description" That is, the Title (Name) of your entire blog. Click that, then spend an hour thinking of a name that sounds totally cool. Ok welcome back! Unfortunately, I couldn't manage to think of a cool name, so I ended up with something silly. I hope you fared better. After I was done posting my very first blog entry, I noticed that it said "Uncategorized", which made me realize that there are things called categories. Upon further inspection I realized that it was I who actually had to make the categories, there weren't any preset ones. I think categories are going to be useful, if you want to have different subjects you're blogging about. It should also help your readers to find things they're interested in. Maybe someone doesn't care about ...say beer, but they do want to read whatever you have to say about the game CA. So you make categories, and then both you and whoever reads your blog (nobody), can easily find entries they're interested in! And again, they're nice because you can get creative with names for categories and stuff. I haven't, I have got some super generic names for my first 2 categories. Parents and children. Basically, what that means is that you can have categories within categories. I have a "Forum thingies" category, and inside that I further split into "Tips and Tricks" and uh, other things that will come later (yes, I've already thought about what I will do, no, I am not saying what it is now). So you can have lots of categories, and your blog will be tidy and easy to navigate. Best feature ever right? To pick a category for a specific blog, you need to select one before posting it (if you go into advanced edit mode, you'll be able to edit the category of the entry too in case you didn't assign one before). It's in a box called additional options, right under where you're writing the text of your entry. You can't miss it. So this wraps this entry up, there's other settings that I haven't discussed, because they didn't look particularly interesting. You can of course take a look and see if anything looks useful. I hope this little guide has at least made you realize that Settings do exist, and that you can use them to your advantage. Oh, and if you still haven't figured out what to name your blog, that's ok. Naming isn't easy. That's what Elodin says anyhow. I have to admit I was all gung-ho about the blog at first and then kept forgetting to post stuff... I never really explored the settings feature and didn't know anything about the naming feature. Thanks for posting this! !